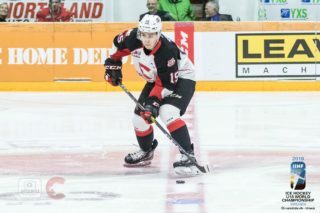 The Prince George Cougars are pleased to announce goaltender Taylor Gauthier and defenceman Cole Moberg have been listed by NHL Central Scouting in its midterm rankings in advance of the 2019 NHL Draft. 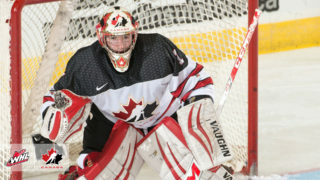 Gauthier is ranked fifth among North American goaltenders and is the second-highest rated netminder from the Western Hockey League (WHL). This season, the 17-year-old has played in 35 games and sports a 12-17-2-1 record, to go along with 3.04 goals against average (GAA) and a .904 save percentage (SV%). He also has three shutouts that is tied for second most in the WHL. Since December 28th, the Calgary, AB, product is 5-4-1-0, with a 2.40 GAA and a .930 SV%, to go along with a pair of shutouts. Gauthier was recently named the WHL Goaltender of the Week for the week ending January 13th. 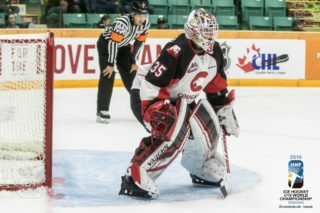 The Cougars’ netminder is one of two WHL goaltenders selected to play in the Sherwin-Williams CHL/NHL Top Prospects Game in Red Deer, AB, this Wednesday. Moberg is ranked 175thamong North American skaters and is having a breakout season. The defenceman has already set career highs in goals (nine), assists (15) and points (24). His nine goals are tied for fourth among WHL defenceman. Moberg is the Cougars’ top scoring defenceman and is fourth in team scoring. 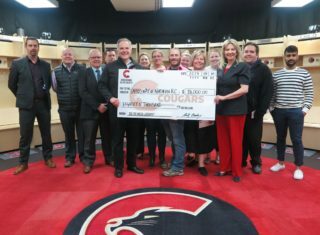 The North Vancouver, B.C., native is in his second season with the Cougars. To date, he’s played in 110 WHL regular season games and compiled 12 goals and 24 assists for 36 points.